Although hip, knee and other orthopaedic implants are well-established prostheses, much remains to be understood about how these implants wear in use. This important book summarises the wealth of recent research in this area and its implications for implant and joint design. After an introductory overview, the book reviews the causes and prevention of implant wear. Part one discusses fundamental issues such as tissue response to wear, the anatomy and biomechanics of hips and knees as well as the materials and design issues they raise for hip, knee and other types of orthopaedic implant. Part two considers wear phenomena in a range of materials, including ultra-high molecular weight (UHMWPE), metal and ceramic joints. It also covers surgical and other factors influencing wear as well as ways of detecting, analysing and predicting implant wear and failure. 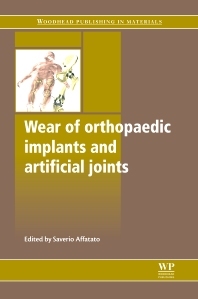 With its distinguished editor and international team of contributors, Wear of orthopaedic implants and artificial joints is a standard reference for implant manufacturers, surgeons and those researching this important area. Researchers, materials scientists, clinicians and prosthesis manufacturers. Saverio Affatato is a Medical Physicist at the Rizzoli Orthopaedic Institute (IOR). In particular he is the responsible of the Tribology area at the Medical Technology Laboratory of the IOR.